The lecture sketches out the background to the call for the First Crusade, narrates a few of the major events as context for the main story of the lecture, and then concentrates on what has been and can be learned from the Hebrew and Latin sources for the Jews’ responses. It concludes by raising the question of the appropriateness of the language of trauma to categorize the European phase of the crusade and its impact on the continent’s Jews. 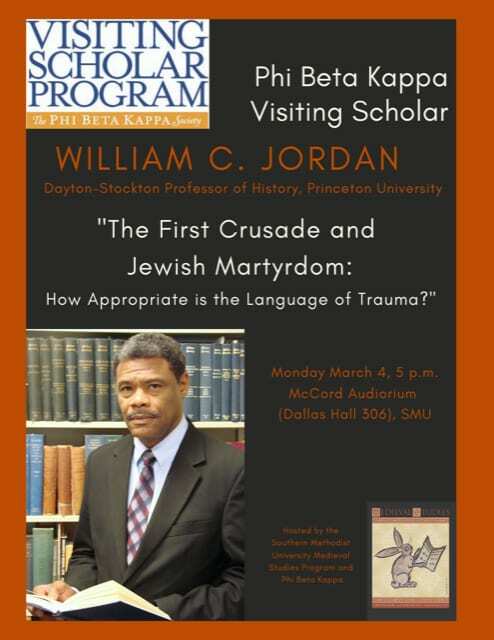 Monday, March 4, 5pm McCord Auditorium, 306 Dallas Hall. William Chester Jordan is Dayton-Stockton Professor of History and served as Chairman of the Department of History at Princeton University, where he teaches courses on the Middle Ages. Professor Jordan’s most recent books include A Tale of Two Monasteries: Westminster and Saint-Denis in the Thirteenth Century, Men at the Center: Redemptive Governance under Louis IX, and From England to France: Felony and Exile in the High Middle Ages. At Princeton he served as Executive Director of the Shelby Cullom Davis Center for Historical Studies and as Chairman of the Interdepartmental Committee and Program in Medieval Studies. His honors and awards include a Rockefeller Foundation Fellowship, an Annenberg Research Institute Fellowship, and a Residency as Distinguished Visiting Scholar at the American Academy in Rome. He is past President of the Consortium for the Teaching of the Middle Ages (TEAMS) and served as President of the Medieval Academy of America.